Of all of the sewing patterns I own, the Oliver + S Bedtime Story pajama pattern has been used the most. It's been traced over a dozen times (and is still holding up well!). 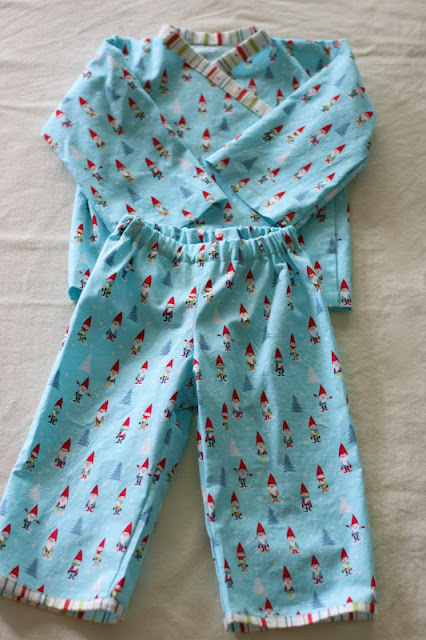 As well-loved as these pajamas are around here, I decided to include them in the care package I was putting together for the wife of one of Dan's friends. They've been sorting through some developmental issues with their toddler son. While I have not been through their specific situation, we have experienced several periods of intense sorting through regarding Evangeline's health and development. There were unknowns to wrestle, appointments to juggled and a mama heart that tried to be brave but felt pretty vulnerable. In our case, everything turned out to be fine in the end. But I walked away from those experiences feeling more convicted that we moms need to support and encourage one another. It's been a long while since I've sewn for a toddler boy. When Jude was that age, I had a malfunctioning sewing machine and I didn't even know how to correctly sew a hem. 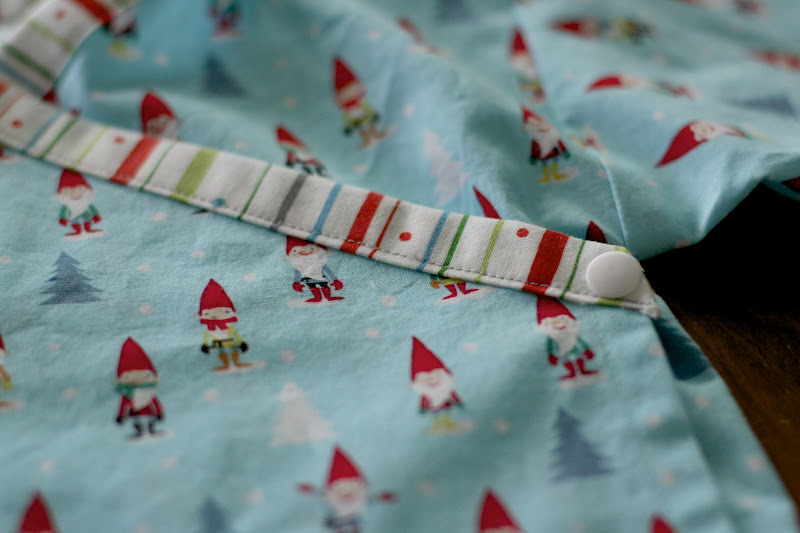 So, as I was sewing these winter pajamas, there was an excessive amount of gushing about the utter cuteness of the toddler boy - with a good deal of reminiscing about our boy as well. Jude picked out this gnome - the kids call it elf - fabric for his own Christmas pajamas. I added snaps instead of ties, which I'd highly recommend. For us, the ties came untied frequently. I also added some interfacing to reinforce the snaps at the seam allowance. 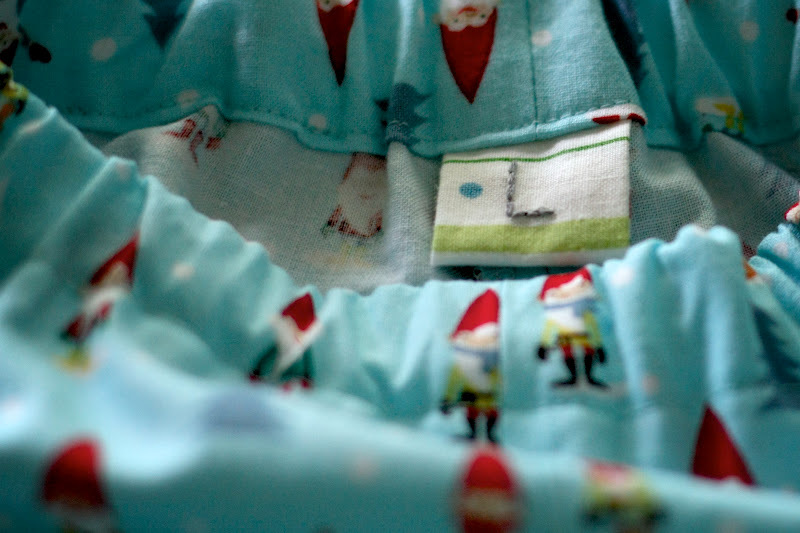 To the pants, I added a tag with the first letter of this sweet boy's name embroidered to it. And my care package looked like this. 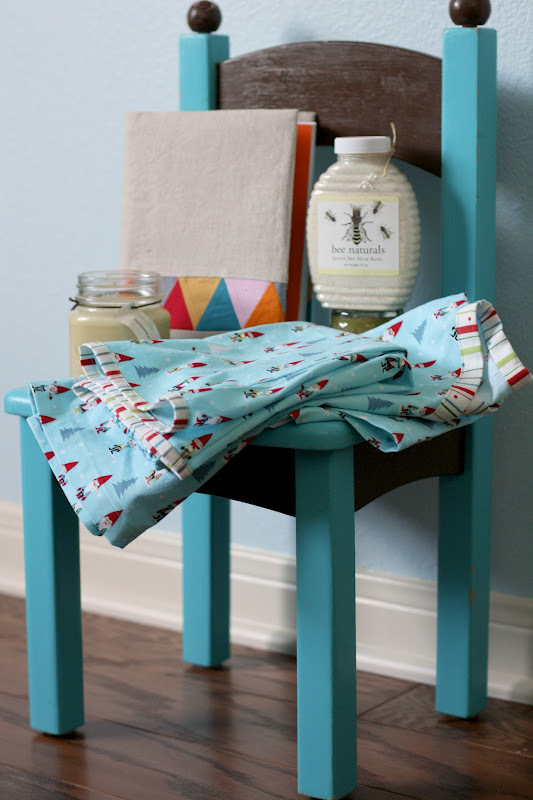 The covered journal, pajamas, this soy candle and this milk bath. I hope it makes her feels extra special. what a wonderful care package! Beautifully done and very sweet. How sweet. Love those pjs.